Choosing the right sails can be a daunting experience for any sailor. Whether you’re new to cruising or you’ve been knocking around local waters for years, the lure of open water and longer passages can get to you. When it does, it’s important to have the right sail inventory. 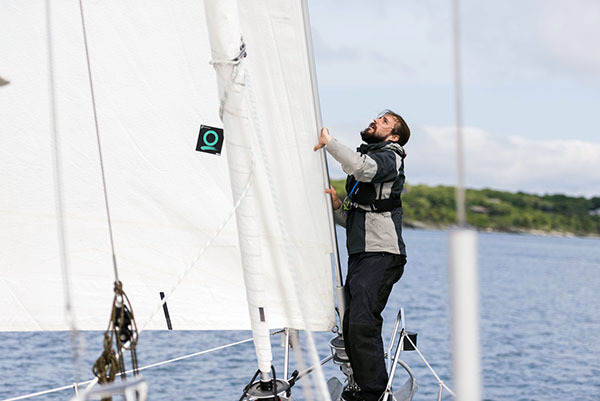 This series, How to Choose Your Cruising Sail Inventory, Quantum's Dave Flynn will help guide you through the process and make sure you know what questions to ask. To achieve the best handling and versatility, you want your headsail to be as small as possible, while still being able to drive the boat well in reasonably light to moderate conditions. When land is nearby, a sail failure, or not having the right sail for the conditions, is no big deal. On the open water, however, sails really are the engine. Sadly, sail inventory on many cruising boats is low on the list of priorities, but it’s worth the investment if you’re considering a long trip. When you buy a boat used or new, there’s a good chance you’ll need to reconsider your inventory. Used boats often include used sails that show their age and miles. Most new boats come with stock sails that are usually minimalist; rarely do they incorporate the construction details and features needed for more serious sailing. Is your inventory ready to go? What sails will you need? Are special materials or construction details needed? If you need sails, do fancier new materials make sense? How about storm sails and deep reefs? Are your hardware and sail handling systems up to the task? For part one, let’s start by looking at your headsails. The larger the mainsail (relative to the headsails), the smaller the genoa needs to be. Check the foot length of the mainsail ("E") versus the base of the foretriangle from mast to stem ("J"). If they are equal, or if E is longer than J, the boat relies more on its mainsail for horsepower, so the jibs can be smaller. The latest "performance" cruising boats have huge mainsails and use non-overlapping jibs as the primary sail. On the flip side, many older or more traditional cruising boats have relatively small mainsails and big "J" dimensions. These are genoa-dependent and will need larger headsails. LP is the shortest straight line distance from clew to luff. It’s expressed as a percentage of "J" (150% LP = 1.5 x J). It does no relate directly to area, but is a measure of overlap. For a given percentage of overlap, you get a much bigger sail on a boat with a long “J” dimension. A larger, stronger, and more experienced crew can better manage a bigger sail. If you sail in San Francisco or Buzzards Bay, you won't need as much sail as someone on Chesapeake Bay or Long Island Sound. Going larger (say from a 135% to a 150%) is usually only a benefit in less than 8-10 knots. Additional LP is a liability in more breeze. It this also a marginal, if any, benefit reaching and running. Genoas for roller furling can usually be used while partly furled if allowances are made in the initial construction, though shape deteriorates relative to the amount the sail is furled. (Most sailmakers will quote reasonably effective reduction of up to 30% of original LP.) Beyond this you have a triangle, but not much of an airfoil. The higher the clew, the better the sail will be when reaching. It will also minimize the amount of water that’s scooped up by the sail in big seas, making it a little easier to see under the sail. Upwind performance, however, is better with a lower clew. A minimum clew height of 36 inches is recommended, simply so the foot of the sail always clears the lifelines and does not have to be lifted or "skirted" every time the boat is tacked. Your second headsail should be a heavy working jib with an LP between 85-100%. In more than 15-18 knots, this will be the sail to use. In fact, it will likely be the correct sail a large percentage of the time. For sailing offshore, the stay should be located well forward: the working jib needs to remain large enough to be useful. Having a small jib available, however, will help protect and extend the life of the genoa, providing needed insurance against complete sail failure when far from home. Handling and versatility considerations suggest keeping the genoa as small as possible. Build only enough size to maintain the ability to drive the boat reasonably well in light to moderate conditions. The more easily driven the boat, and the larger the mainsail relative to the headsail, the smaller the LP can be. This is even more valid if you are the type of sailor who turns the engine on when winds get light. Quantum’s cruising experts are here to help you every step of the way to make sure you have the right inventory for your needs. Take advantage of our expertise. Whether you need new sails, service, or just want to make sure you’ve got it right, we can help. Stay tuned for part two: mainsails.